I have been sprucing up my laundry room hoping that it will motivate me to actually do laundry on a regular basis. (If you know this doesn’t work, please don’t spoil it for me.) I wanted to add some warmth with a curtain, and I live in CA where houses are practically touching each other so window treatments are a necessity. I opted for a cafe curtain so some light would still come in, and found a boring white one at Target for $15, and I knew I could add some polka-dotted flair with paint and a stencil sponge. Read on to get the DIY details! First, the basics: always measure the length of the window before buying curtains or hang your rod to match the curtain length. I put the rod in the middle of the window thinking it would be standard size, but it wasn’t so I had to make some adjustments like cutting off the tabs at the top (I didn’t want them anyway) and then “hemming” (folding the bottom hem under with liquid stitch and ironing). Then I put paper down because the paint can bleed through the fabric, and taped off the bottom of the curtain so my polka dot lines would be straight. Prepped to paint, I used some paint I already had from my living room focal wall and stencil project and mixed it with with a little white. You can use any paint, and even craft paint would work well. Then all you need is a stencil sponge to do the rest. I have found that the best way to use a stencil sponge (especially when stenciling) is to dip it in the paint and then remove some of the excess paint on the sponge before applying the paint. Then it’s time to dot! I did the top and bottom dots first, and then middle to make it easier to line up and create a pattern. It’s such an easy way to spruce up white curtains with any color you want! I might make a spring/summer version with yellow polka dots next, what do you think? If you’re curious about the rod, my hubby and I put it together with 3/4 inch piping and some flanges from Home Depot. The piping was originally black, but I cleaned it and spray painted it with “hammered antique pewter”. 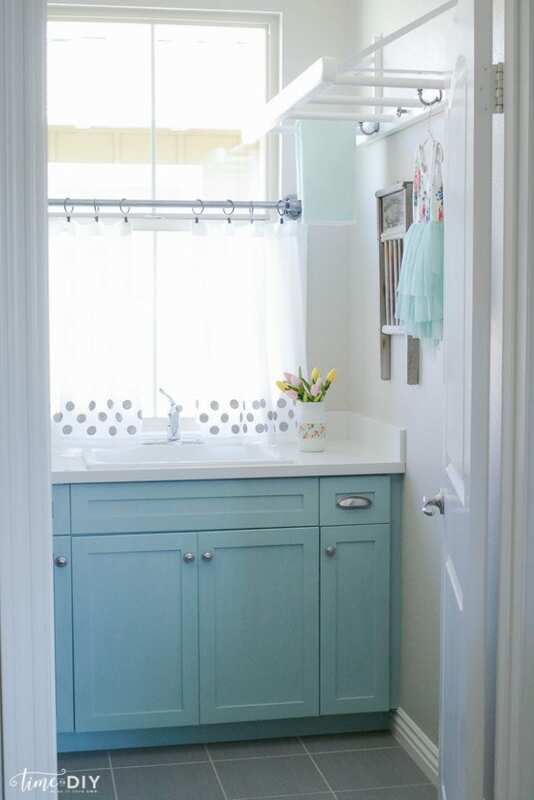 You can check out my other laundry room updates like my painted cabinets. And a great solution for creating more space with a DIY clothes rack. Or if you like the industrial piping look, the DIY open pipe shelving that frames my family room fireplace/TV. 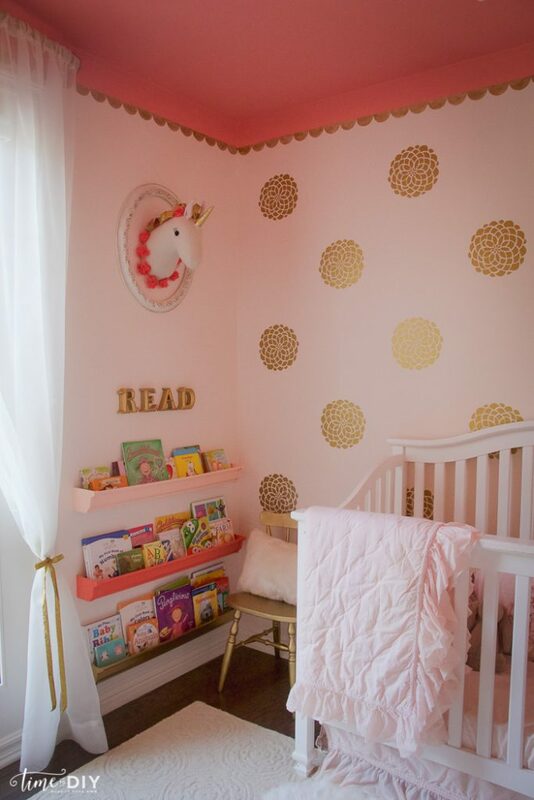 Follow Time to DIY on Facebook | Instagram | Twitter for more home decor ideas like Debby’s absolutely adorable gold glam Toddler Room Reveal! oh this is so cool! Great job! Thank you!! We love them too!